"I didn’t say he stole the money!" A simple statement, but what exactly is the speaker denying? That she didn’t say he stole the money? That she didn’t say he stole the money? That she didn’t say he stole the money? With just the words alone and no context, it might be hard to tell. 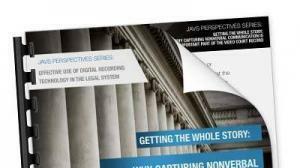 In the latest white paper from the JAVS Perspectives Series, Julie A. Helling explores the importance of a video component of an official record. In “Getting the Whole Story: Why Capturing Nonverbal Communication is an Important Part of the Video Court Record,” Helling writes, “Discrepancies can exist between written transcripts of a court hearing as different court reporters may interpret tone and nonverbal communication differently.” Additionally, touches on the studies that show how nonverbal communication shapes the meaning of communication. 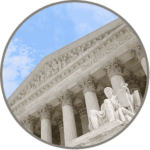 She goes on to say that courts are beginning to recognize that the information captured by written transcripts and full A/V recordings differs.